Does the arrest or death of key Drug Trafficking Organizations affect drug flow? (U//FOUO) There is the assumption that marijuana trafficking from Mexico decreases annually in the summer months due to it being the end of the harvest cycle. Subsequently, the only marijuana available for trafficking is the remainder from the previous year’s harvest in the fall. (U//FOUO) Generally, a steady stream of drugs are trafficked across the Southwest border (SWB) as long as they are available in Mexico. There was no change in the seizure rates when a key DTO member was arrested or killed. 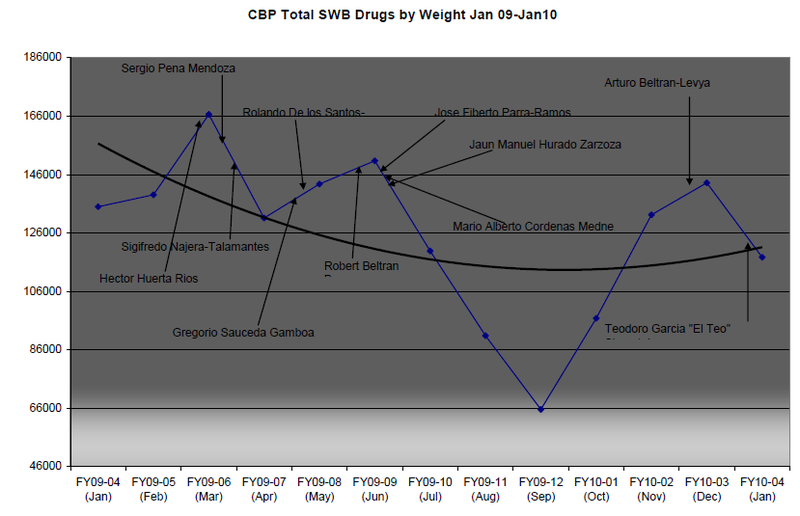 If the weight of drugs seized was increasing prior to the event, the trend continued. If the weight of drugs seized was decreasing prior to the event, that trend also continued. Availability due to agricultural growth cycles had the greatest impact. The lowest seizure rates correlate directly with major religious holidays. Arresting one or two individuals from a DTO does not significantly impact drug trafficking flows. (U//FOUO) The total amount of drugs trafficked across the SWB is unknown. (U//FOUO) DTO line of succession operational capabilities is unknown. (U//FOUO) The removal of key personnel does not have a discernable impact on drug flows as determined by seizure rates. DTO operations appear to have built in redundancy and personnel that perform specific duties to limit the damage incurred by the removal of any one person. By sheer volume alone, drug operations would require more than one individual to coordinate and control the process. 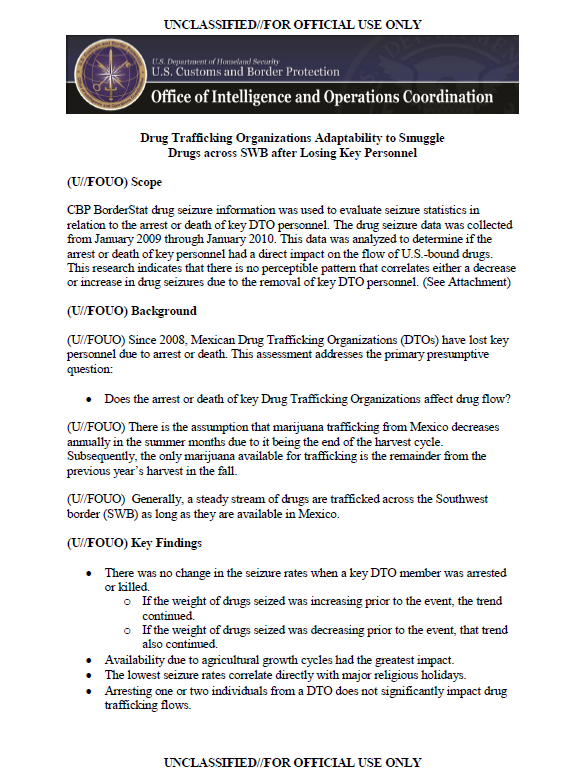 While the continued arrest or death of key DTO leadership may have long-term implications as to the control and viability of a specific DTO, there is no indication it will impact overall drug flows into the United States.